Sonoma County Winegrowers president Karissa Kruse unveils the group's new wine label logo promoting its sustainability efforts. 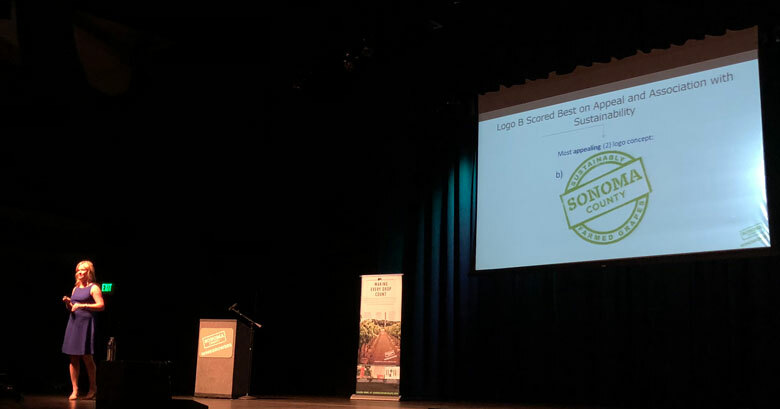 Santa Rosa, Calif.—Eager to put the pain of the October wildfires behind them, the Sonoma County Winegrowers held its annual meeting Thursday with a focus on the positive and an image for the future with a new label logo. Approved after a couple years of development, the logo includes Sonoma County in large font and box with the phrase “Sustainably Farmed Grapes” in a circle around the box. The logo has the same design theme as both the winegrowers’ logo and that of the Sonoma County Vintners. Winegrowers president Karissa Kruse said the logo is on the labels of nearly 24,000 cases of wine that are ready for shipment. That news was also in a press release issued by the Winegrowers, which is also continuing to make progress on its goal of having all the vineyards in the county certified as sustainable. To date, 92% of the county’s roughly 60,000 acres of vines have undergone a sustainability assessment, and 72% have been certified. More than 1,400 individual vineyards have been certified, and 75 wineries have also been certified. The logo, which is on labels of Ferrai-Carano and Dutton Estate Winery wines as part of a pilot program, is a key element of the Winegrowers’ strategy to successfully market the county’s sustainability. “For the first time, we now have a logo for the label,” Kruse said. Kruse said the Winegrowers worked with market-research firm Wine Intelligence on how consumers perceive sustainable products and found that 68% of high-frequency wine drinkers would opt for a sustainable product. In a straight preference study between a wine with the sustainable logo and one without, more than 90% of consumers chose the bottle with the logo. The logo was particularly popular with consumers from the millennial generation. Wineries can use the logo in a variety of colors. In its 27th year, the Winegrowers’ meeting and tradeshow, known as Dollars & Sense, was held at the Luther Burbank Center for the Performing Arts. Blackened trees and the remains of burned buildings are still visible in the fields near the center as well as along Highway 101. Whole neighborhoods were destroyed in this part of Santa Rosa, and the events center was at risk, too. Sonoma County was particularly hard hit by the fires, and Kruse said the Winegrowers group is eager to move forward, although it will take time. When Kruse asked audience members if they had to evacuate or if they knew someone who lost a home, every single person raised his or her hand. Kruse lost her own house in the fires. She said she evacuated at 2:30 a.m. and received her first media call at 5 a.m. She said during the week of the fire she did 70 interviews and made 15 appearances on national news broadcasts. Despite the widespread devastation, Kruse said Sonoma County’s vineyards remain largely unscathed and—as many in the audience already knew—the vineyards served as crucial firebreaks during the height of the fire. The Winegrowers’ housing recovery fund has raised more than $700,000 to date, thanks to large contributions from area wineries, other winery associations, individual donations and charitable events around the country. The group has supported 170 families of wine industry workers with $500 gift cards as well as up to two years of rent support. Kruse said she continues to work on developing the Sonoma County Center for Ag Sustainability, which is drawing experts from the United States and Europe to hash out the sustainable future of farming. The Winegrowers group is also launching a program to support the industry’s workers. Kruse said each month, vineyard companies can nominate their employees to be honored as exceling in a particular field such as frost protection, communication or worker safety. Winning workers would receive a $500 gift card, “swag,” public acknowledgment and be invited to a celebratory luncheon at the end of the year. Nomination forms will be posted to the Winegrowers’ website. A nearly $450,000 USDA specialty crop block grant will be used to support local and national marketing efforts. Some of these include the consumer and trade “boot camps” as ways to get visitors to the county to participate firsthand in the work of grapegrowing and winemaking. The Winegrowers’ first camp for sommeliers drew nine attendees from around the nation who arrived in Sonoma County in 2017 eager for a chance to taste the county’s wines and see the vineyards firsthand. Unfortunately, those sommeliers arrived Oct. 8 and by the next day had been evacuated and were on flights back home. Kruse said they are all eager to return this year for a second chance.